As with all our waterfront vacation rentals in Sanibel Harbour, Bay View Tower 732 features outstanding views from all window and sliding glass door openings. Beautiful dark hardwood floors throughout the unit and a large leather section sofa with recliners on each end in the living room. The granite counters and stainless steel appliances create a strikingly modern kitchen at our vacation rentals in Sanibel Harbour. Both bathrooms updated with new fixtures along with the master bathroom outfitted with a TV. King size bed in the master bedroom, a queen bed in the guest bedroom, and an additional double inflatable mattress. 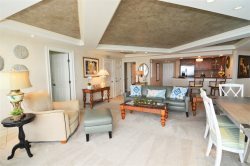 Find out more about our luxurious bay view condo rentals in Sanibel Harbour. You may have found this rental on HomeAway 4363837, HA ID 4363837, VRBO 4363837, or Vacation Rentals 4363837. Excellent stay. Beautiful condo, well stocked with high quality supplies. Building well maintained. Beautiful landscaping. Excellent location. Beautiful condo with great views and spectacular sunsets! I am in the hospitality business and your entire staff is some of the best that I have worked with.We carry over 75,000 people a season so I know how thinks should be. Had a slight problem with parking Chris was right on it .. Thank you !! What an outstanding and friendly team! We asked for an early check if possible due to flight changes and traveling with an elderly parent and immediately her voice told me she understood and wanted to help. We were very grateful to be able to check in early. We have been coming here for ten years and hope to continue this tradition! We have had ten years of excellent service staying in this property. It is a perfect location and enjoy everything these units have to offer. The setting of the property is beautiful, relaxing, and close to everything. The staff is great to work with they could not be any friendlier! It was nice that they were on the property to address our concerns of no pool towels in our room nor no wash clothes, but they were brought up quickly! The room was super for my parents and us! We have stayed at both Resort Harbour Properties with our children when they were so little and loved the experience! My husband usually does the Podiatry Conference at the Marriott and the one year our kids were young, the hotel was in charge of renting your condo rooms out! We loved it then! So we came back with my parents who are dealing with Health issues and we all enjoyed every minute we had at the condo! We are spreading the word as we speak as it is so wonderful! The pool was so warm and inviting! Loved they had "Noodles" for anyone to have as it helped my Dad in the water be able to swim a bit! It was the best vacation we had with our parents in a long time...may have been their last...we'll see! Your team was wonderful to work with. We were kept up with information from emails that were automatically generated and very helpful from your office. We hosted a wedding at the Marriott next door, but many of the families stayed at the Bay Tower condos. They were so accommodating with check in and check out times. Everyone loved the beach and pool area and the screened in screened in verandahs. The girls were friendly, and quick to respond on any question. Very accommodating!